Red Nose Day is an institution, not only in the UK, but also in many other countries throughout the world. Comic Relief realised that using comedy to entertain people and entice them into donating money is a classic combination and it's proven to be very successful as a way of raising cash to help those in need. Comic Relief started in the UK in 1985 as a response to the famine in Africa and occurs every second year. Two of it's major sponsors are the BBC where it is broadcast and Sainsbury's, who sell Red Nose Day merchandise. If you want to get involved in Red Nose Day fundraising, there are plenty of opportunities to do so. All you need is your imagination and some organisation to get people involved and interested in raising money for charities. If you work in a large organisation or even a small office, there are plenty of chances to raise some funds for Red Nose Day. Most people enjoy the thought of having a fun charity afternoon at work so if the boss says it's ok, arrange something where everyone can get involved. You could auction off your boss or your team leader to raise cash, or perhaps you could get them to simply donate on behalf of the company. 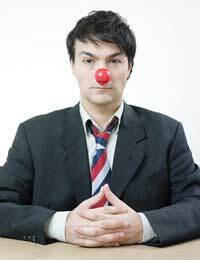 If you want an easier way of making cash that is less intrusive on the daily working environment, why not sell Red Nose Day products at work. People will often buy items for charity if they're presented to them in an easily accessible way, so take some red noses in and sell as many as possible. You could even do something as simple as having a morning coffee event where home made baking is sold off for gold coin donations. Alternatively, if you want to arrange some fundraising outside of work hours, you could invite all of your work colleagues and friends to a fundraising disco, trivia night, dinner party or other event. The most obvious aspect of Red Nose Day is of course the colour red. So, this year, why not highlight the colour as much as possible in your activities. Even deciding to dress in red for the day can help you get donations, so dig out all your red clothes and make a statement about your nonprofit fund raising. If you're feeling a little more adventurous, why not dye your hair red, paint your face red or even paint your entire body red! Anything that draws attention to your cause and gets people reaching into their pockets to donate is a good thing. Remember, it's only one day and your contribution can make a huge difference. If you don't want to get dressed in red yourself, why not stick Red Nose Day magnets on your car, or put a red nose on your aerial. It may not raise you money, but by buying the products to decorate your car, you've already contributed in a small way towards the overall total raised. There are numerous events that you can hold for Red Nose Day; it's dependent on the extent of your involvement, commitment and organisational skills. Getting children involved in simple competitions at school such as obstacle courses, colouring competitions, cake bakes, wacky races and more can be a fun time for them and a great money raising scheme. Getting them to hold a car boot sale to get rid of all their old items is also a fun way of not only clearing out unwanted toys and clothes from your home, but can add money to the Red Nose Day pot. If you have an area where you can hold a local fete, why not try doing this with a distinctly red theme. Being creative with typical fundraising ideas can add more of a Red Nose Day feel - changing all the sweets in a jar to red sweets where you guess the number inside can keep it in line with your red theme. You can also encourage local musicians, dancers or actors to take part in a special 24 hour 'whatever-a-thon'. Dressed all in red, they'd have to carry out their specialist act for as long as they could while people sponsor them and guess times on how long they can last. For the amateur entertainers out there, a great fundraising idea is a sponsored karaoke, talent show, or red-themed fashion event. There are never any shortages of ways to make money for Red Nose Day, so get your thinking cap on and start arranging your fundraising event now. One of the no most popular programs on TV today are the antiques road show cash in the attic bargain hunt antiques road trip and others. Having been an avid watchers of these programs I have come to know that numbers of there front men are very good playing musical instrinmemts and very popular in there own right. May suggest that you speak with the programs editors at the BBC and suggest you approach the following with view to.have them do a spot on the night. The following names may be of help. Paul Martin floggit very good drummer and guiter playinrt. Adrian Partrage flogit very good violin player. Jointly Herdon cash in the attic piano player. Paul Hays cash in the attic singer and comparrer. I have watched all of the above play at one time or other on there shows. Just thought Pat Duffy. Tel 07963 057726.